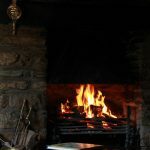 A warm Welsh welcome awaits you at our beautiful 18th century stone farmhouse and guest cottages. We have an abundance of fresh air, peace and tranquillity, relax by the lakeside and enjoy the sight of a heron or a red kite; look out for a flash of blue and if you’re lucky you may even see a kingfisher! If you’re feeling energetic, go for a wander through fifteen acres of woodland and conserved countryside. In the mornings, we offer delicious cooked breakfasts in the main house or, if you’d prefer to eat in your cottage, farmhouse hampers are generously-filled with fresh local produce such as our delicious honey from the bees here on the farm, free-range eggs and homemade preserves. 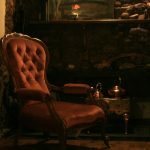 A stay at Fferm-y-Felin will be a peaceful and memorable experience and we look forward to welcoming you to our home. 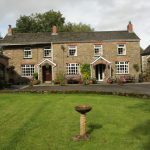 Fferm-y-Felin nestles in 15 acres of unspoilt countryside. 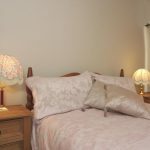 Here you can enjoy woodland walks, bird watching, trout fishing in a large lake near the farmhouse and pony rides for the children can be arranged. Our traditional Welsh breakfasts, using local produce, are a delight and will set you up for a day of walking in the beautiful countryside, exploring historic castles, relaxing on our beaches or shopping in the nearby market towns. 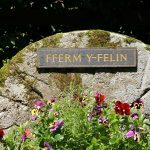 Fferm-y-Felin is a wonderful place to experience nature at its best, there is a large lake behind the farm house where you can often see brown trout. This attracts our local heron, who you can spot in the early hours of a misty morning. 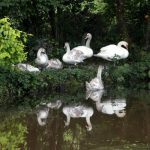 You may be lucky and see the arrival of a family of Mute Swans. Wild ducks, moorhens and geese also frequent the lake and if you explore further you may find frogspawn and tadpoles in spring, and an abundance of insect life as well as beautiful wild flowers in our meadow. We have a flock of sheep and, at certain times of the year, you can take an active part in feeding and herding the sheep. At Fferm-y-Felin, we sell delicious honey made from our hives on the farm, home-made preserves, as well as freshly laid free-range farm eggs. All of this local produce is also used to cook your delicious breakfasts. In our small farm shop, we sell beautiful Welsh blankets woven locally. Or treat yourself to Mary’s Farmhouse ice cream, which is heavenly on a sunny day!